Some of the Kinect hacks we have featured here are quite useful in the realm of assisted living, others showcase what can be done with the clever application of video filters. Some…are just plain fun. This pair of Kinect hacks are not necessarily going to win any awards for usefulness, but they are big on fun. 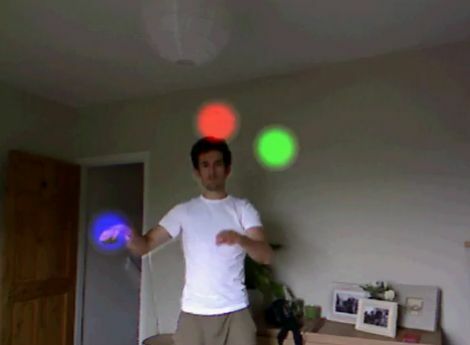 [Tom] put together a neat juggling application that watches for your hands to disappear behind your back, generating a glowing ball once they return to the camera’s field of vision. The balls can be tossed away or juggled as you can see in the video below. It looks like it could be pretty fun and most definitely easier than chasing balls around while learning to juggle. [Tom’s] hack was based off code he saw demonstrated in a video by YouTube user [hogehoge335]. His application for the Kinect allows him to replicate the Kamehameha attack from Dragonball Z, flowing hair and all. Check out the videos below for a demonstration of both Kinect hacks, and swing by the respective Google Code sites if you want to give them a try. The DBZ one is awesome. Just need someone with graphics skills and you’d have a 15 minutes of fame hit game.. like angry birds. Kinnect juggling ranks right up there with “Most useless machine” as my most favorite thing ever.